The week back from break offers a good opportunity to observe areas of growth in my friends. I generally watch and let the children show me areas of big leaps forward or areas where we may need to refocus our attention. This week two aspects our classroom stood out. We are going to be entomologists this month. The first bug we are learning about is the honey bee. We are making our own honey bee finger puppet. It requires cutting of the body parts, the wings, gluing it all together and painting black stripes clearly so we can tell this particular flying insect is a bee. I demonstrated making one for the class. Then I observed the children make their own. How did they make their bee: did they get their scissors and glue all at once? Did they cut everything out then go get the glue? Did they cut the head and glue the eyes and make the face before doing anything else? Did they ask what to do at each step? Did they glue each piece of paper together without cutting at all? What I was noting was each child's focus on the task and I was looking at how they sequenced creating the bee. This craft provided me the opportunity to see how my friends are developing their ability to create a logical order of events, which will come in handy in reading, mathematical reasoning and everyday life skills. I then take that information and plan specific lessons for each child based on their specific needs. Morah Katie: Lochlan how will the bee get from flower to flower? Morah Katie: How will the bee know where it is going? Morah Katie: How many legs do you have Maia? Morah Katie: How many body parts will you need Jade? How are the children responding to any new challenges they meet this week? In addition to the bee finger puppet, we had a "make your own bug" craft. As my friends worked at both the bee activity and the bug craft, I watched each child's approach to the cutting. If they found it challenging, how did they respond? Did they stick with it and "do their best" whatever their best for that day was? Or did they shy away and avoid it? Cutting is a skill a child works to develop. It requires fine motor control, eye hand coordination and focus. A young child needs to develop the muscles in their hand to open and close the scissors, and coordinate the movement of those scissors in one hand while holding and turning the paper with the other hand - all keeping their thumb pointed up and the scissors pointed away from their body. It is fair to say this could cause some frustration for young tiny hands. How can we help the child who wants to give up on cutting out the head (or all the parts) for the bee/bug? We acknowledge that they are feeling challenged and express to them our belief in their ability. If they ask us to cut it for them, we ask them "what part can you do?" 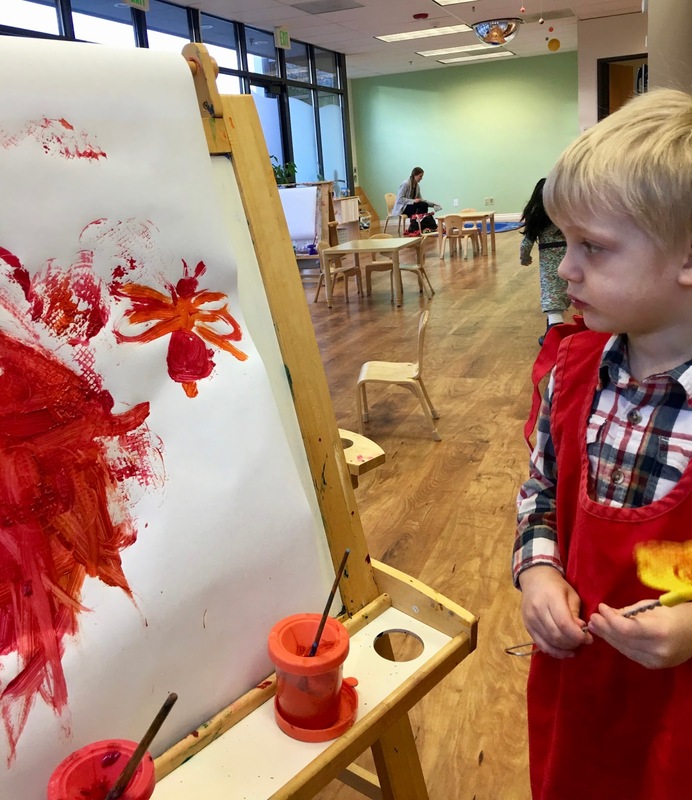 As they begin to actively get involved, it is important to acknowledge it, and then allow the child to continue independently so we can see the natural progression of their skill. Children learn through trial and error. Maybe the bee they make this week does not look like the bee they wanted to make. The bee craft will be out all month, with practice and encouragement, perhaps by the end of January they will have a hive of bee puppets they are proud of because they kept cutting.